My little Udayan came home Friday with a fever and runny nose; his first viral cold since having started junior kindergarten three weeks ago. He is rather good when he is unwell – he doesn’t cry or whine and he goes on about his day without complaints. The only thing I could complain about is the fact that he doesn’t eat and he absolutely hates soup. I don’t have the heart to force my little one to eat soup especially when he is already feeling so lousy, so I make him tomato rasam which is kind of like a soup. Tomato rasam which is both spicy and tangy, is made with freshly ground rasam powder, tomatoes, tamarind pulp, shallots, ginger, garlic, turmeric, curry leaves, coriander steams and leaves. The spices in rasam is good for digestion as it is for cold and fever. 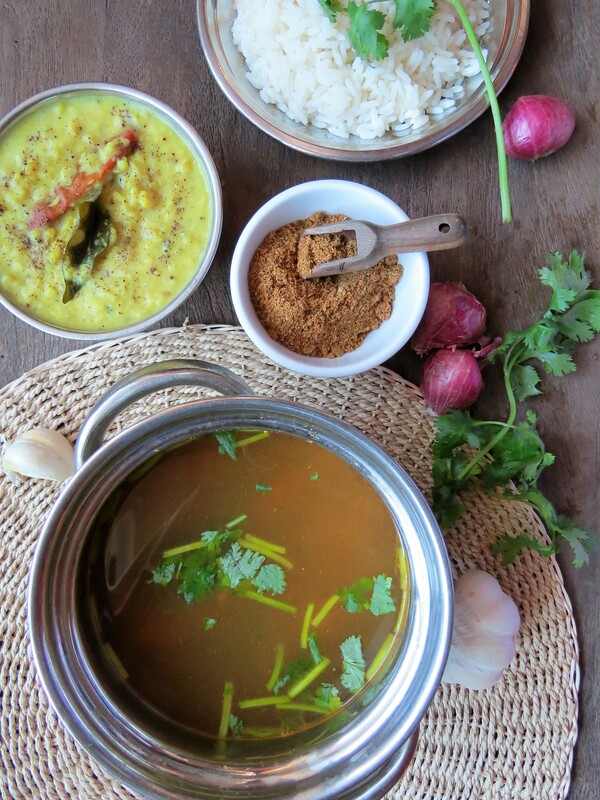 Although rasam is great on its own, I serve it with soft rice (rice that has been cooked with additional water), and lentil curry to make it more of a complete meal. 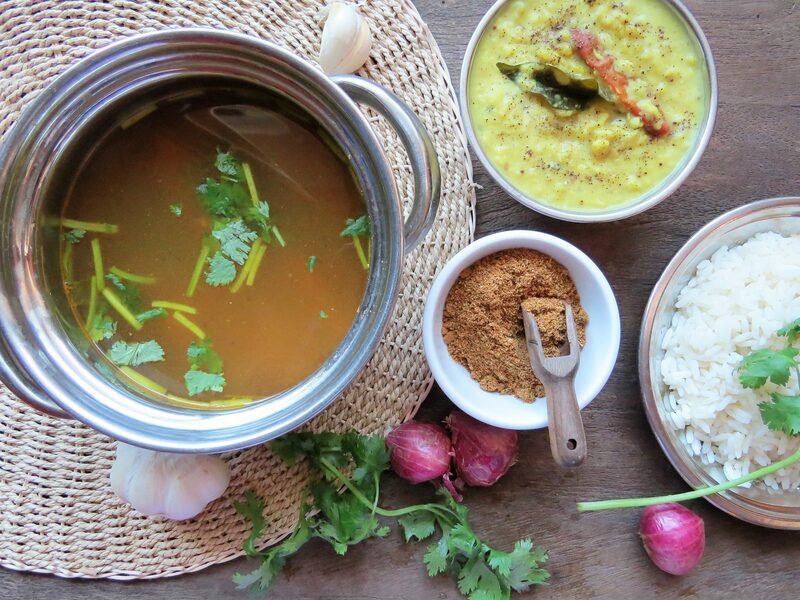 You can even add cooked lentils to the rasam rather than make lentil curry. Whichever way you decide to eat this flavourful soup, you can be certain that it will help make you feel a little bit better a little bit sooner. Soak the tamarind in warm water. Squeeze the tamarind and blend well to make a pulp. Reserve. On a pot dry roast the shallots, ginger, garlic, and curry leaves for a minute. Add the chopped tomatoes, pinch of turmeric, and salt to taste. Cook on medium heat, until tomatoes are soft. Add the tamarind juice and water and bring the contents of the pot to a rolling boil. Let boil for an additional ten minutes. Add the rasam powder, coriander leaves and stems, and turn off the heat. Check seasoning and adjust accordingly. Dry roast all ingredients on low-heat until the spices turn a shade darker and release their aroma. Stir often to prevent burning. Let the spices cool and then grind into a fine powder. 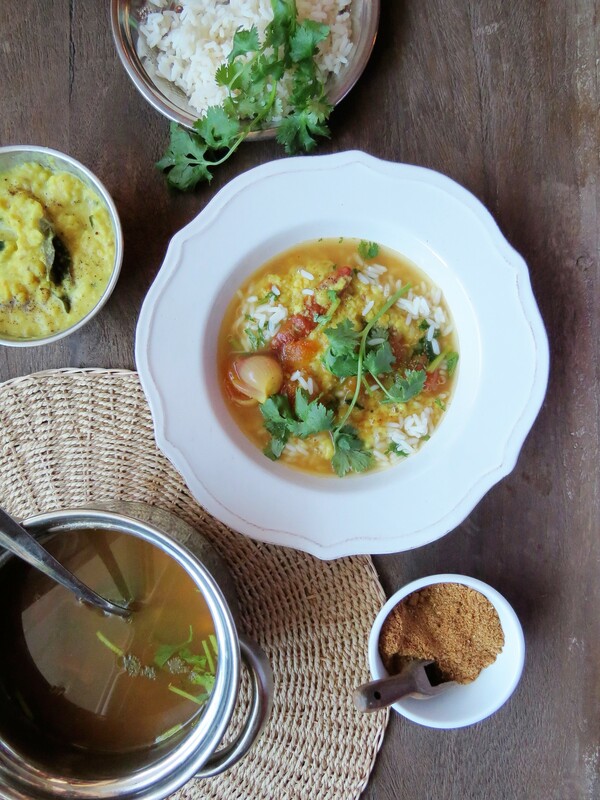 Rasam can be eaten plain like a soup, or with rice, or as a part of rice and curries. Chicken can be added to make chicken rasam or mutton to make mutton rasam. To learn more about the spices and herbs used in this recipe, check out Ingredients That Help Battle Cold & Flu Symptoms.